Knurled grips are first to ensure good grip without tearing up your hands or gloves. Then, it may be for look. 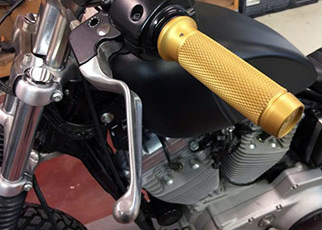 So, if you ride hard, maybe do a wheelie from time to time or occasionally hole-shot at stoplights, knurled grips offer the security of good grip/no slip. Offered in gold anodizing for Harley pull or dual cable on 1” diameter bars. $99.95 per set. Available through Biker’s Choice, your Brass Balls Cycles dealer or online at Brass Balls Cycles. If those are metal grips they should fry your hand like a waffle iron after setting in the sun. Might be nice in brass for a vintage look instead of a cloth or leather wrap.